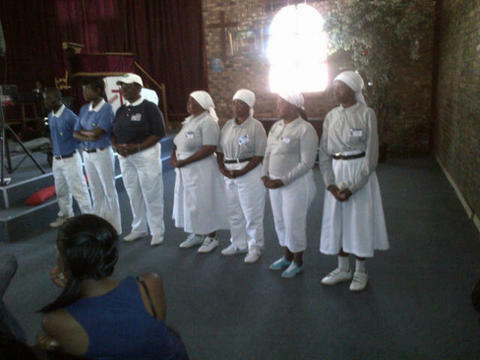 Saturday the 26th of January 2013 was a very special day for IkamvaYouth Gauteng as we opened our doors to new applications for the year. 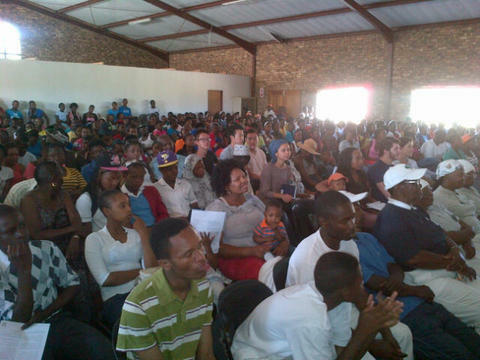 Open Day for both branches in Gauteng were jointly held at Ebony Park and it was exciting to see over 600 learners in attendance. The new applicants were all eager to see what IkamvaYouth had to offer and how they would be assisted to improve their marks. 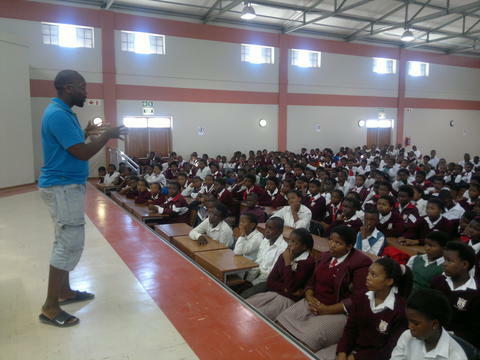 The day started off with the District Coordinator, Patrick Mashanda, explaining what IkamvaYouth was all about and how IkamvaYouth would assist the learners within the community. 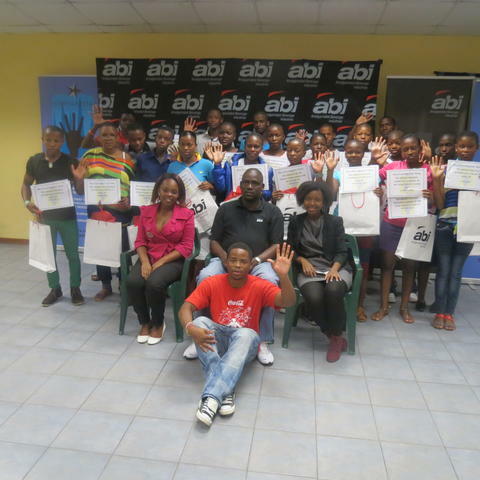 Many of our supporters including ABI, Tzu Chi Foundation, Advtech, Mindset Network, ERM, EOH, Thoughtworks were present cheering all the learners on to take responsibility for their future and improve their marks. 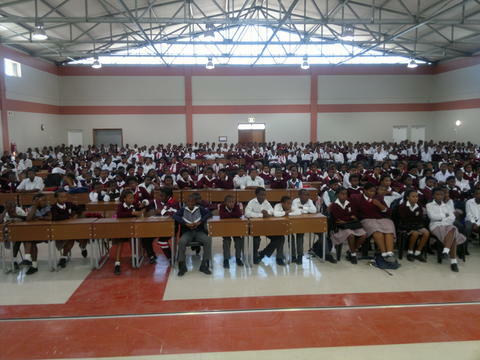 A prize giving ceremony immediately followed and all learners with over 80% attendance for 2012 were awarded certificates of achievement and the Grade 12’s with distinctions were recognised. Ntebaleng Morake, a Grade 12 with 4 distinctions, said a few words to thank everyone who supports IkamvaYouth and also encouraged learners to know that they too could excel at school. Loads of fun ended the day off with donations of cokes, a DJ and music from ABI and pies from King Pie. We are ready to change some lives this year, are you? 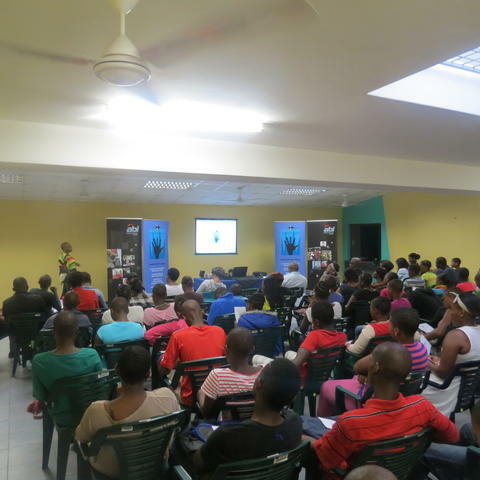 More than 150 community members from Umlazi AA section and surrounding areas came to the AA Library to learn more about IkamvaYouth last week Saturday on the 19th of January 2013. Among those in attendance, were existing and potential lkamvaNites, parents, and partners ABI & the library. The Branch Assistant N’thabiseng Zwane welcomed our guests with the help of one of the IkamvaYouth learners Sindisiwe Sibisi who sang a beautiful song to open the day, Branch Coordinator S’bonelo Cele presented Funeka’s story which explains IkamvaYouth in 3 minutes and then briefly explained in broader detail what IkamvaYouth does. A group of learners presented a play/poem on what IkamvaYouth means to them, followed by one of our tutors Samukelo Jili who spoke on behalf of all the tutors explaining to the community what they need from them in assisting the learners in problem areas. 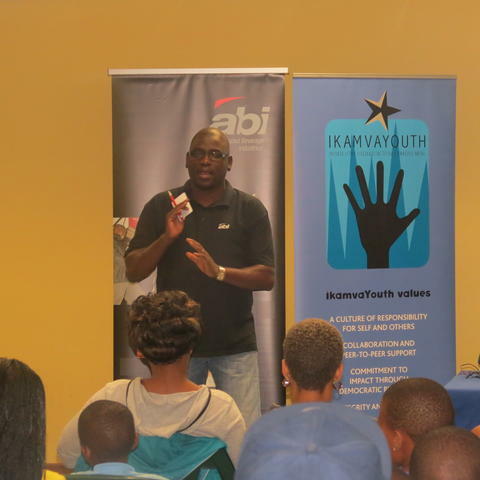 The ABI Cooperate Social Investment Coordinator from KZN Samukelo Nkosi, spoke on behalf of ABI explaining the role they play in society including IkamvaYouth and shared some words of wisdom to everyone in the hall. This was followed by Andile Memela the Head Librarian at the AA library on its involvement with IkamvaYouth. After a word from our guests, the floor was opened for a Q and A session with S’bonelo. During the refreshments break guests were treated to a performance by two local poets who recited a piece on HIV/AIDS, later joined by two local contemporary dancers. This was followed by a rap group that performed a song they had written about IkamvaYouth which got crowd interaction. As the final part of the day we moved on to prize giving. 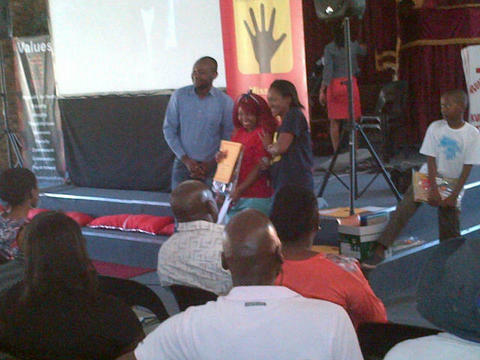 The prize giving is IkamvaYouth’s way of commending the learners who are dedicated to the program. This year’s prizes were sponsored by ABI, which shows their ongoing support for the branch. 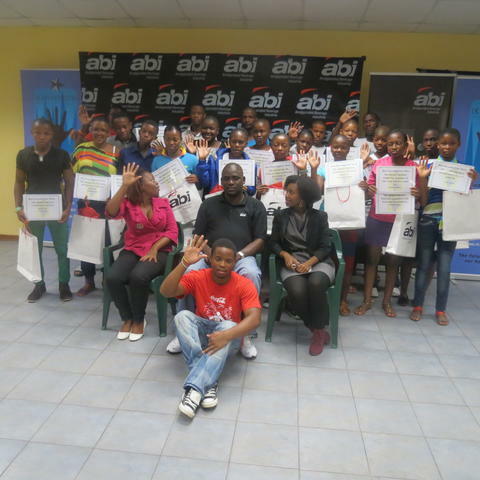 The learners took pictures with their gift bags, followed by lunch which was sponsored ABI. Now we look forward to the year ahead. The ABI Cooperate Social Investment Coordinator from KZN Samukelo Nkosi, spoke on behalf of ABI explaining the role they play in society including IkamvaYouth and shared some words of wisdom to everyone in the hall. 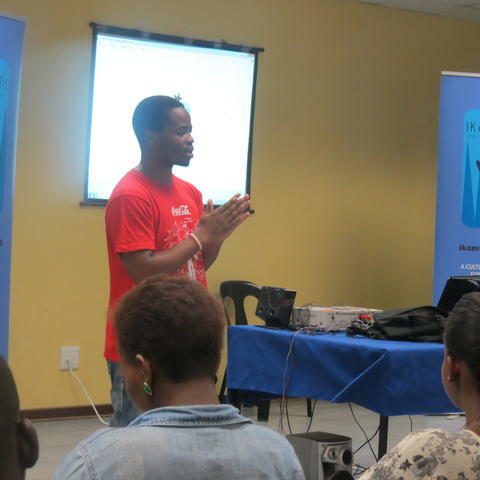 This was followed by Andile Memela the Head Liberian at the AA library on its involvement with IkamvaYouth. 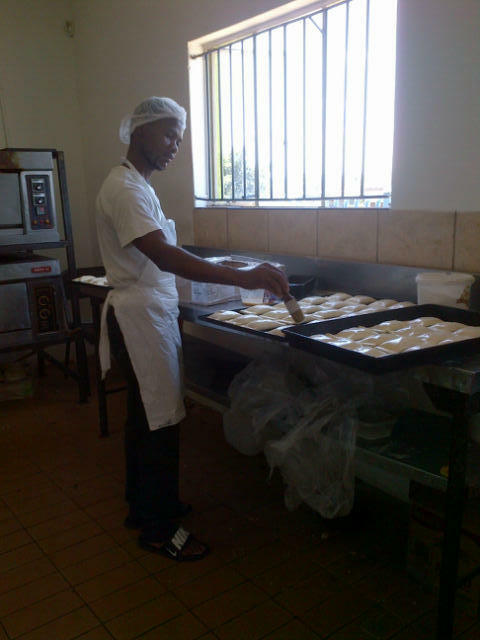 A mere invitation to the Nyanga Open Day was not enough for New Eisleben High School, who requested that IY come and conduct a second ‘Open Day’ to its leaners in their school hall. The Nyanga team happily obliged and on the 23rd of January, spent precious time with the school’s learners, telling them about IY and the support available for them throughout the year. The learners listened attentively and asked many questions afterwards, betraying a genuine interest in the program and how it runs. The principal, Mr Mazimela is enthusiastic about the IY model and approach and asked why IY does not launch the tutoring program from the schools, since it is a valuable intervention. This is an exciting query, very much aligned with IY’s 2030 vision, and IY Nyanga is looking forward to working with the school towards 2030, and beyond! 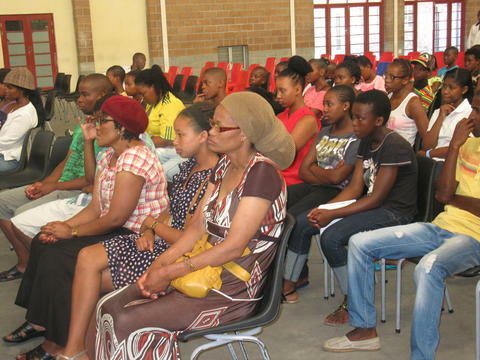 High School students and parents from Nyanga and surrounding areas trekked to Oscar Mpetha High School to hear all about IY Nyanga this last Saturday the 19th of January. The school hall comfortably seated the 80 people who were in attendance, who included current and prospective Ikamvanites, parents, school staff and volunteers. The branch coordinator, Shuvai Finos welcomed the group, and introduced Funeka’s story, which explains the IY model in 3minutes. Branch Assistant, Asanda Nanise then took over the reins and got straight into fleshing out the IY model as explained by the video clip. 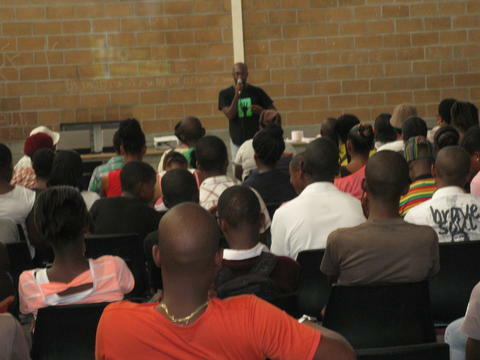 Asanda explained the application process, the attendance requirements and the infamous, yet effective kickouts which are conducted every term. 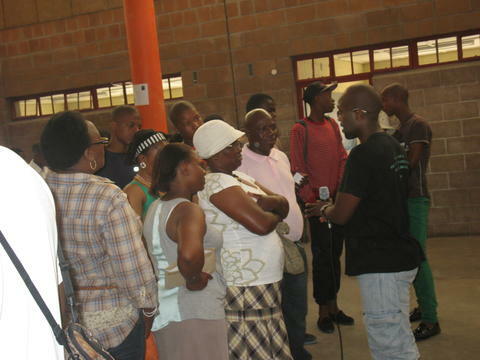 Afterwards, a question and answer segment followed where concerned parents asked whether learners could only attend during Winter School, if they live far from the branch, or alternatively, on Saturdays only. Asanda explained the need for learners to attend regularly so as to get constant and consistent input which is much needed as part of IY’s intervention into learners’ education. At the end of the session, parents and learners collected application forms and then set off, excited to start the journey towards becoming full-fledged Ikamvanites.